Stephen Sutton and Jacob Houck laid out the small village of Centerburg in 1834. It was called Centerburg because it was midway between Columbus and Mount Vernon and made an ideal spot where horses could be rested. Years later the little village was officially recognized as being the physical center of Ohio. During the last weekend of June, the Heart of Ohio USA Days Festival is held in the town. In September, the community hosts its annual Oldtime Farming Festival. Memorial Park is transformed into an event that educates visitors on the history of farming and its importance to the Central Ohio area. The festival also includes cakewalks and a pie auction. 1882 bell cast in Hillsboro, Ohio. 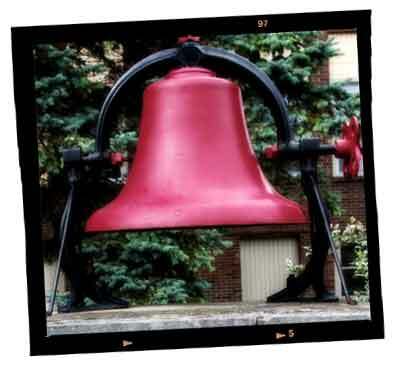 The bell was purchased by Hilliar Twp. Trustees in 1892. The Centerburg V.F.D. erected the bell in 1972. There seems to be some confusion as to whether or not Centerburg is the "geographical" center of Ohio. 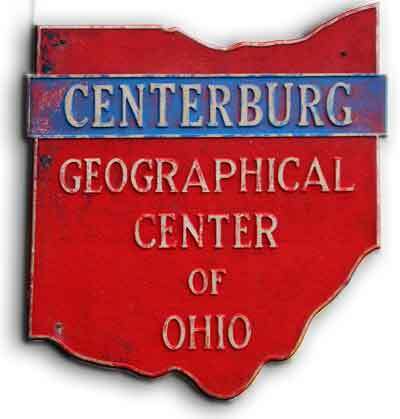 There is a large stone located in Centerburg that declares "Centerburg Geographical Center of Ohio" but is Centerburg really the center of the state? Actually no. According to the Ohio History Central, an online Encyclopedia of Ohio History the geographical center of Ohio is a spot in Delaware County about 20 miles east of Centerburg and 25 miles northeast of Columbus. That seems to be pretty official, but does it answer the question: Where is the center of Ohio? The problem is: how do you determine what the exact center of something so large and irregularly shaped as the state of Ohio? If we were Colorado or New Mexico or any of the other rectangularly shaped states, no problem. But Ohio is a very irregularly shaped river bounded by a large river on the south that has a tendency to change it's size from time to time (the Ohio River today is much wider than it was back in the 1800s). So far, I believe there are at least 4 locations in the state that claim to be the "geographic center" of Ohio. Centerburg, located in Knox County is perhaps the best known. But also vying for that distinction is the spot in Delaware County already mentioned, plus there's one in Morrow County that has a plaque, and another one not far from the big rock in Centerburg saying it is the geographic center. Since the oldest claim to fame is the big rock in Centerburg, plus it has the largest rock, plus it has a time capsule embedded underneath its base that isn't supposed to be opened until 2104, I'm going to unofficially declare it the center of Ohio. Centerburg has already declared itself the "Heart of Ohio!"